Just regular folks. 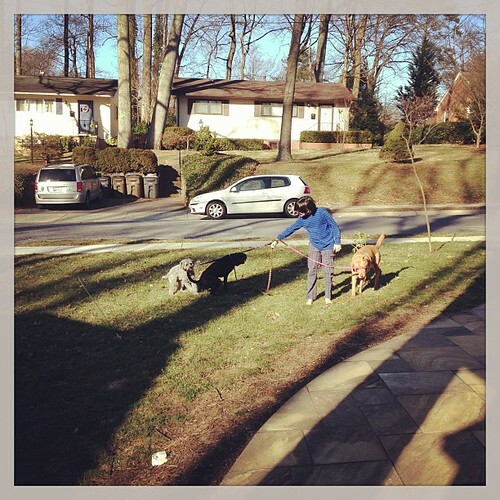 : Walking the dogs. One of Vince's chores is to feed the dogs dinner and take them out to pee. It might be the only one he does reliably because the dogs bark their heads off until he does it. And I can figure out if he didn't take them out to pee if I find a pee spot somewhere in the house later in the afternoon. I try and encourage him to take the dogs out one at a time - but he likes to be efficient. This day, I saw him take all three dogs (which includes Boba who is spending a few days with us) out and our neighbor walked their dog, Lizzie, down the sidewalk and I watched the three dogs pull Vincent (who was trying very hard to keep them on our property) down the sidewalk to greet their friend.